We have been very lucky to see many of our top racehorses go on to be sires and we now have many of their progeny. It was nice to see Toronado having a one two, albeit the wrong way around as far as we were concerned, at Wolverhampton last Tuesday evening in the Novice Stakes with the good looking Ragnar beating Ifreet. Toronado made an impact with his first crop of two year olds last year with 17 winners from 38 runners. We have his highest rated two year old, Watan who came 2nd to Phoenix Of Spain in the Group 3 Acomb Stakes at York. This season sees the first runners for Gutaifan and Night Of Thunder. Night Of Thunder beat Kingman to claim the 2000 Guineas in Richard’s first season at the helm in 2014 and went on to become a multiple Group 1 winner when winning the Lockinge Stakes as a four year old. A very well bred son of Dubawi out of Galileo mare his progeny have done well at the sales with an average yearling sale price of £56,000 last year. We are lucky to have three of his sons that look smart and a filly that also ticks all the boxes. 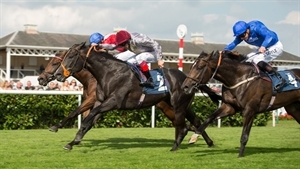 Gutaifan, a son of Dark Angel, was a very speedy two year old winning two Group 2 races including the Prix Robert Papin over five and half furlongs and the Flying Childers over five furlongs. He narrowly missed out on Group 1 success when runner-up to Shalaa in the Prix Morny just getting a little bogged down in the very soft conditions over six furlongs. His yearlings were well received at the sales achieving an average of £41,392 last year for a covering fee of EUR 12,500. Many of his two year olds look very forward and they should hit the track running this year.